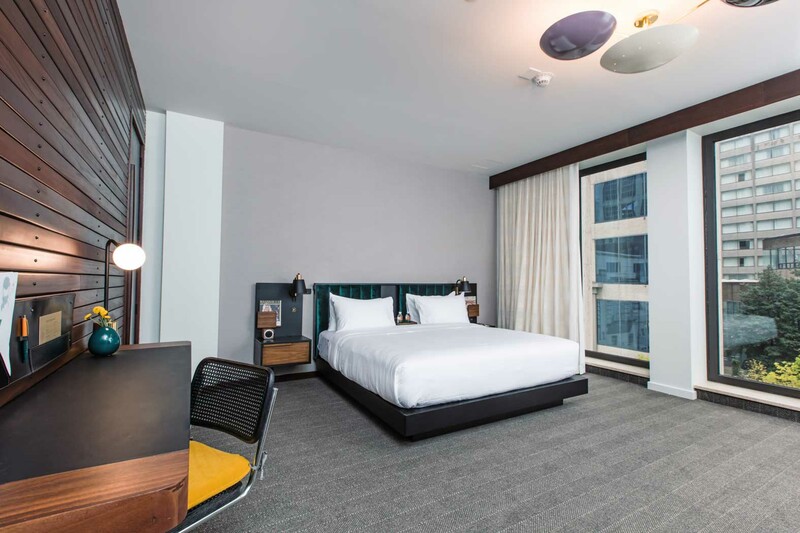 With a playful wink to the past but a clear nod to the future, Fairlane guests step into a true retro-modern experience. 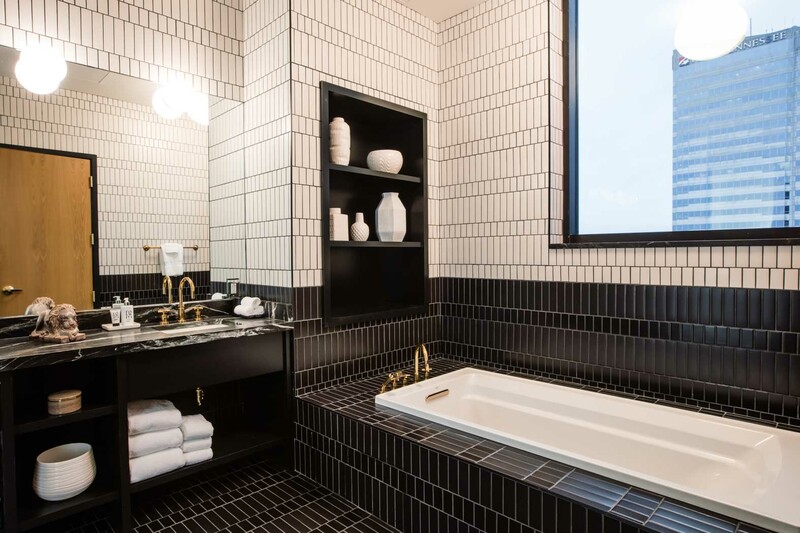 With design details harking back to the 60s and 70s. Comfortable (and highly enjoyable). 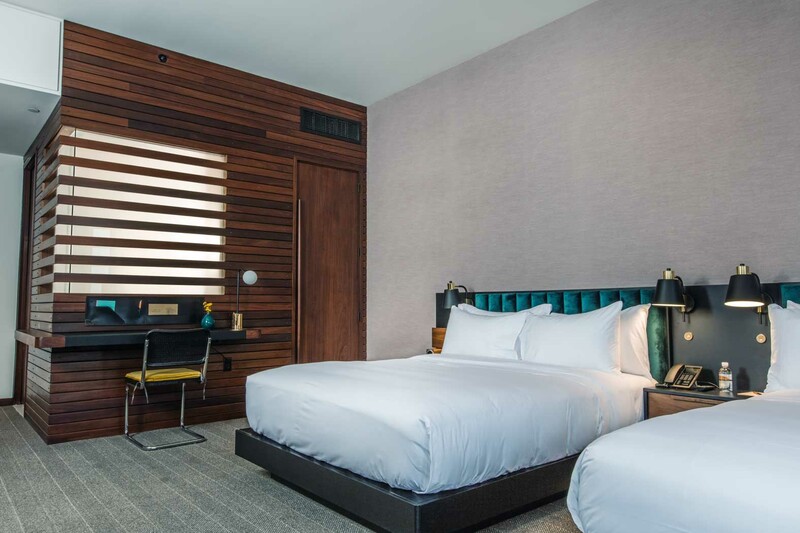 One bed or two; it’s your call. 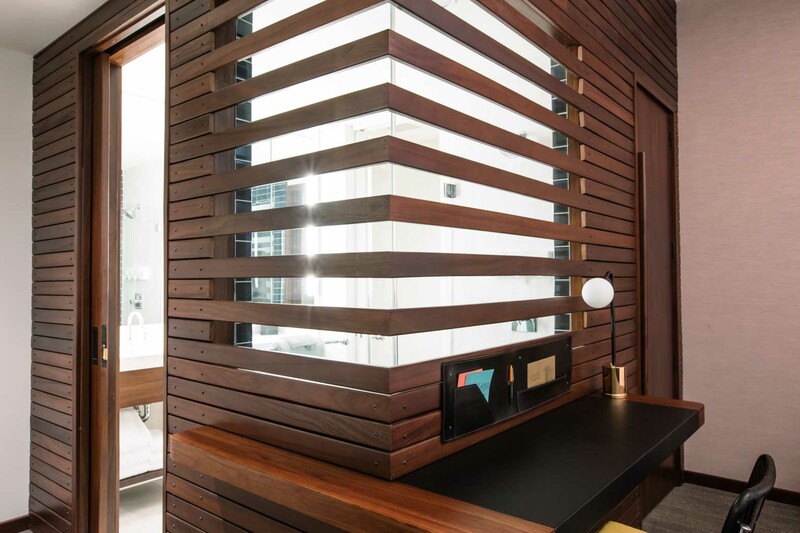 Kick back in a midcentury-inspired retreat with lots of little luxuries. 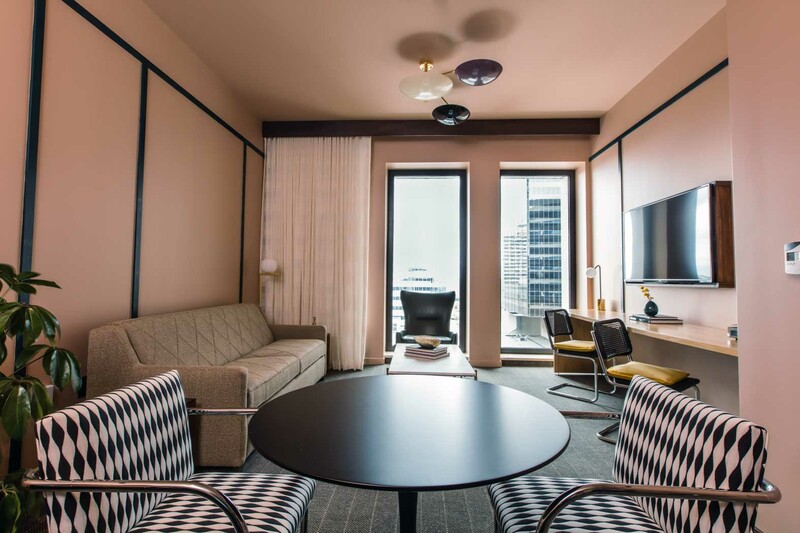 Twelve suites with a retro-modern sensibility and a clear sense of style. 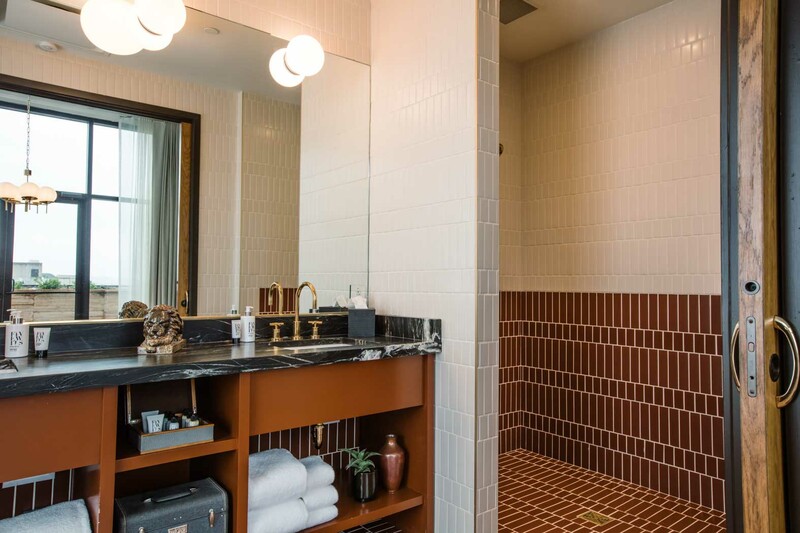 Twin penthouses or the ultimate Nashville pied-à-terre. You decide. High ceilings with plenty of room to stretch out in this oversized King room is just the start. Enjoy the super comfy euro-top king bed with multiple charging options to keep you and yours energized no matter the occasion. 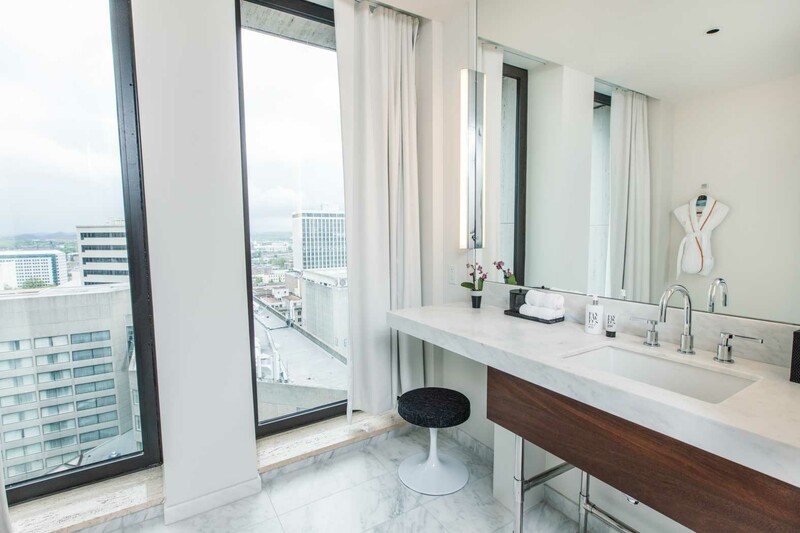 Enjoy the 55" TV, luxe marble peek-a-boo showers, locally-stocked mini-fridge, and the Nashville views through your floor-to-ceiling window perch. 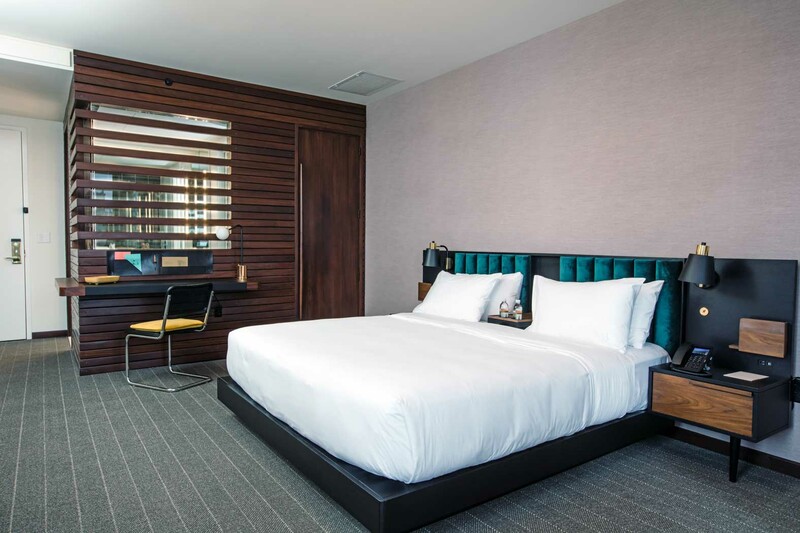 A smart choice for the charismatic and confident traveler looking to make their next power move in Nashville. 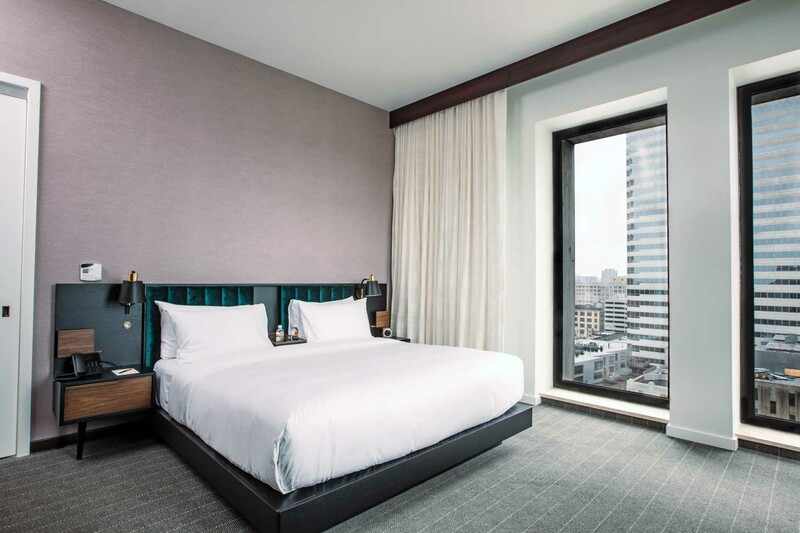 The Corner King features wraparound floor-to-ceiling windows, a comfy euro-top king bed with ample device charging options, luxe marble showers and 55" TV. Make use of the mini-fridge and chill the bubbly in anticipation of your pending success. 340 - 408 Square Ft. This sweet little number gives guests a taste of the good life. 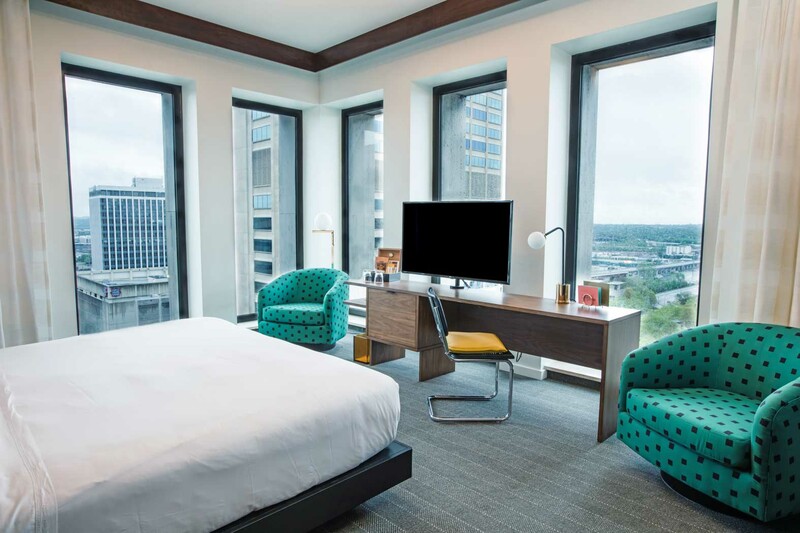 Dive into the euro-top king bed while taking in the views through floor-to-ceiling windows overlooking downtown Nashville. 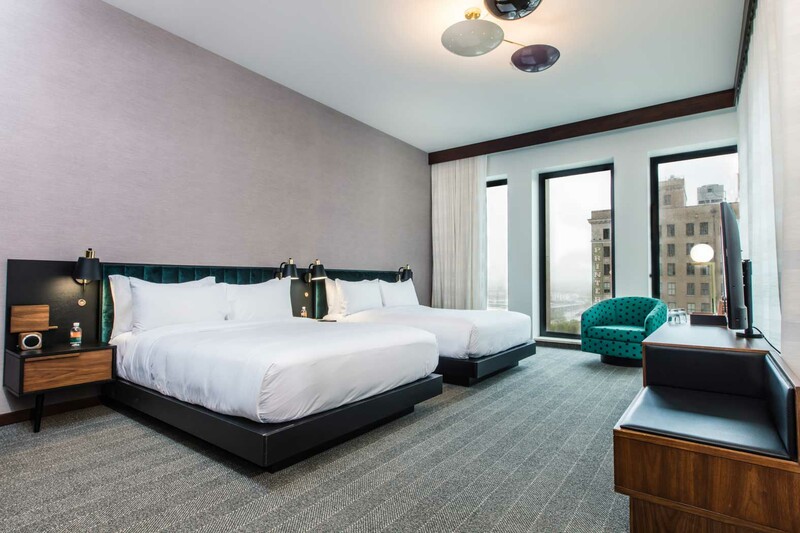 This spacious Cherry Suite includes a queen sleeper sofa, two 55" TVs, plenty of plug-ins and charging stations, luxe bath amenities, a soaker tub and marble shower, and a wet bar stocked with locally-sourced treats to help make your stay that much sweeter. 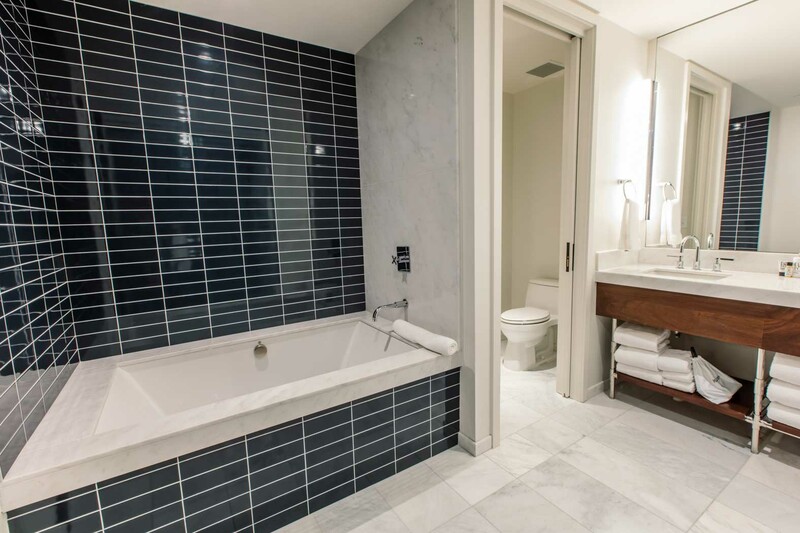 The Jet Junior Suite is all about the perfect landing after a hard day of getting it done. 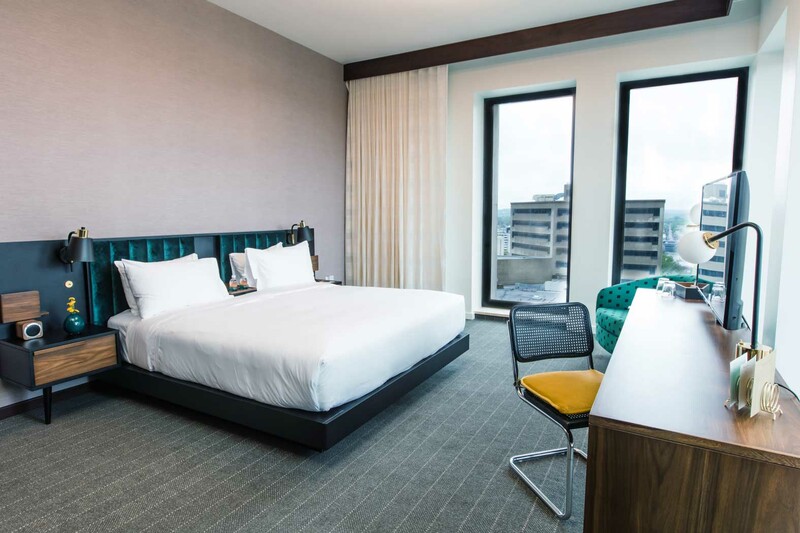 Zone out in front of your 55" TV from your euro-top king bed, or enjoy the views through floor-to-ceiling windows overlooking Nashville's skyline. 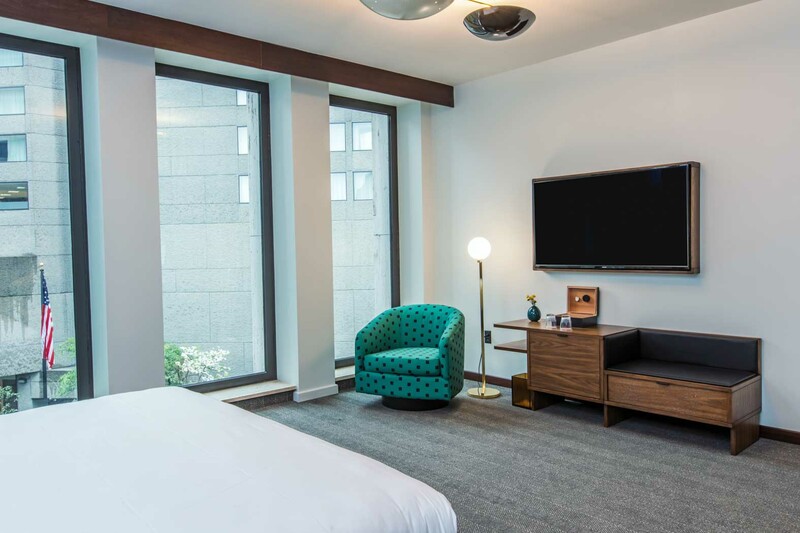 A queen sofa sleeper, plenty of plug-ins and charging stations, luxe bath amenities, marble peek-a-boo showers, and locally-sourced goodies stocked in the mini fridge add the perfect blend of style and comfort for travelers needing a soft place to land. 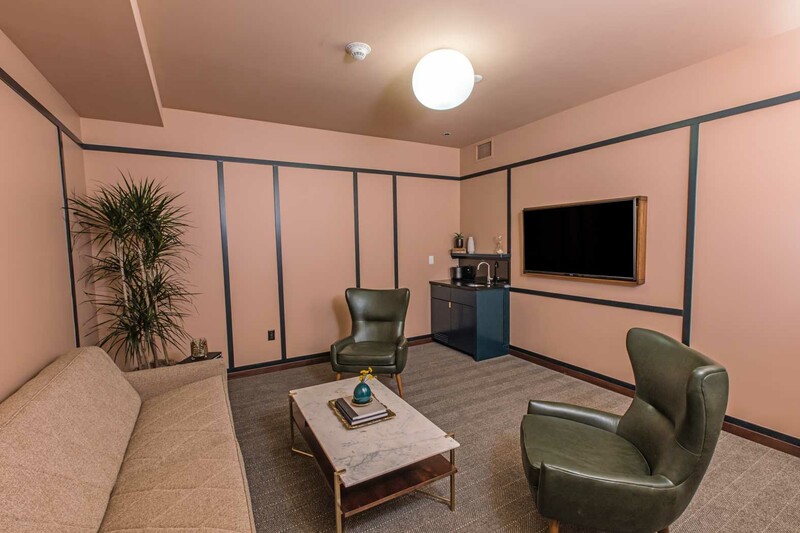 Let's be honest... it's called The Boss Suite for a reason. 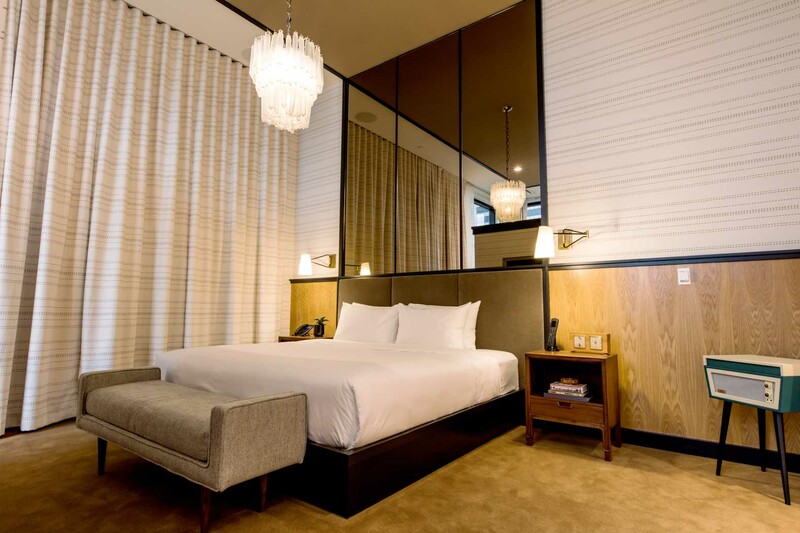 After a day of owning the town, dive onto the euro-top king bed in your plush robe with a highball in hand. 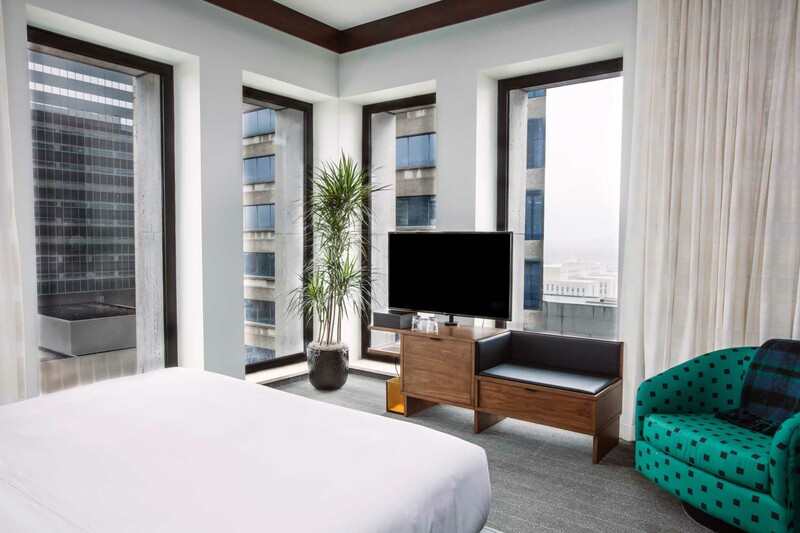 Sprawl out in your spacious perch overlooking downtown from floor-to-ceiling windows, watch your 55" TV...it’s all good. 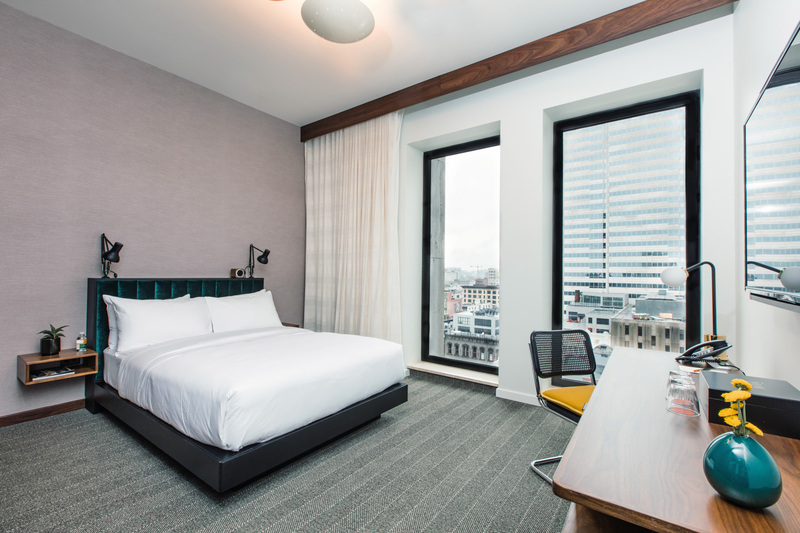 A queen sofa sleeper, plenty of charging stations, luxe bath amenities, and a fully-stocked locally-sourced mini fridge elevate your stay even more. All work and no play? Not here. 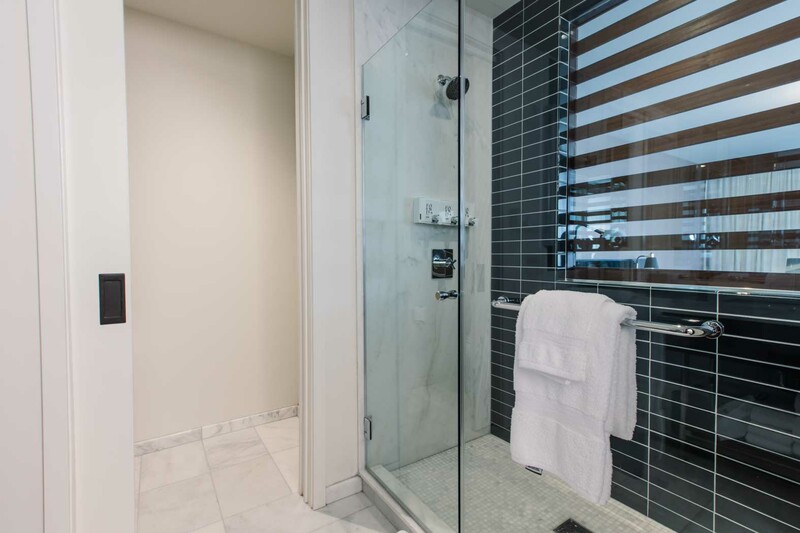 The Penthouse East affords you the luxury to get both done in style.. 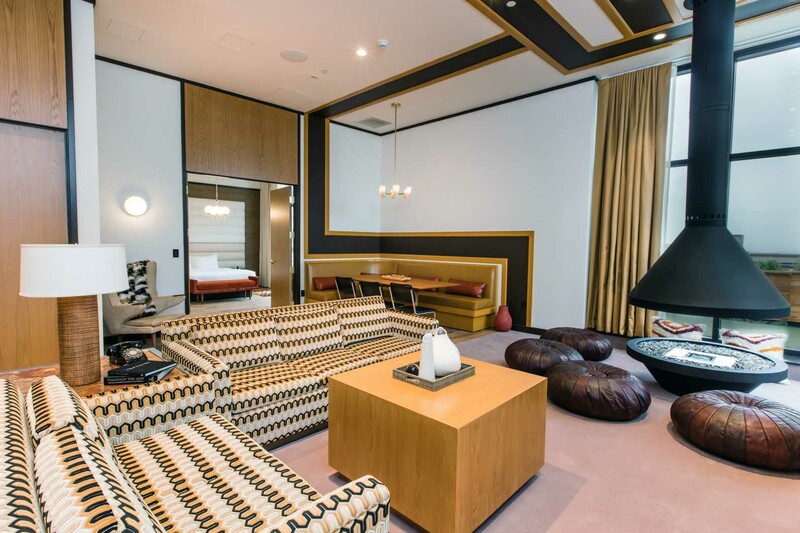 This penthouse perch is decked to the nines with the swag of the 70s. 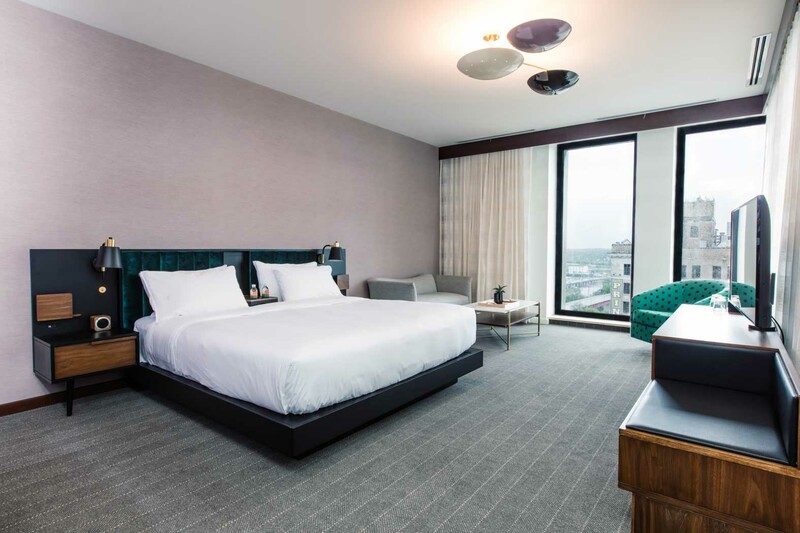 High above Nashville's downtown cityscape, it’s the perfect setting to kick back or get the party started around the firepit on your sprawling outdoor terrace. 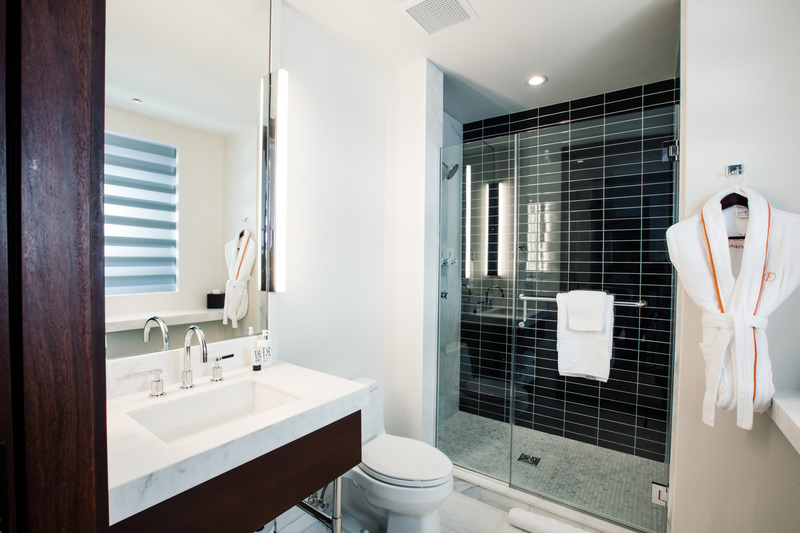 Penthouses East and West can be combined for an incredible, private, whole-floor experience. The hustle is real... so the payoff should be, too. 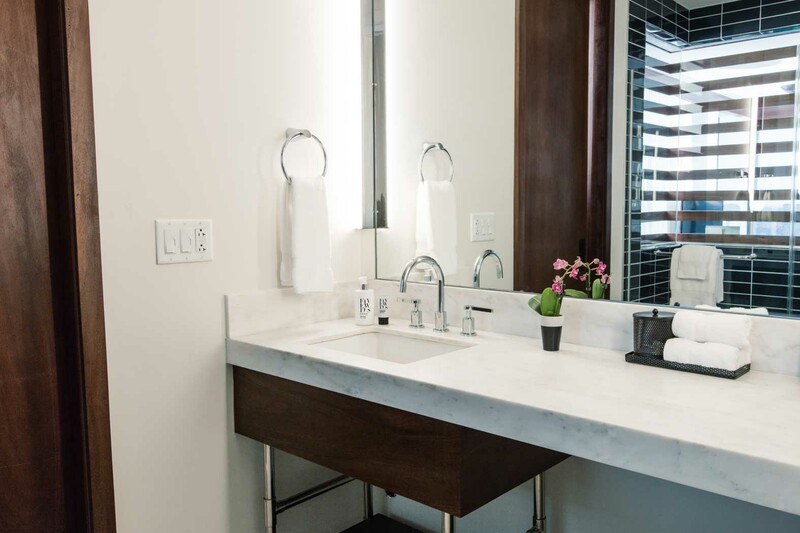 Kick up your heels and toss one back because the Penthouse West is pure swank and sheer swag. 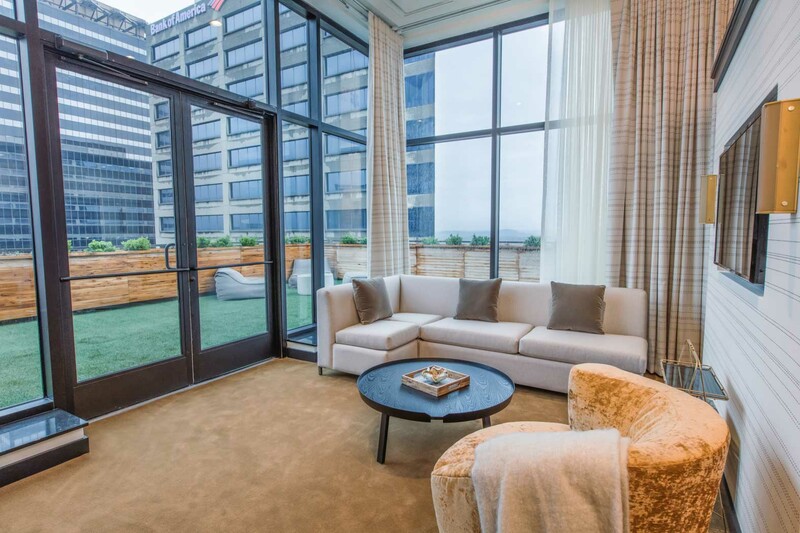 Go ahead and take the party outside on your private furnished terrace overlooking downtown (pretty sweet skyline views, right? ), lounge on your euro-top king bed, raid that mini-bar stocked with local goods. 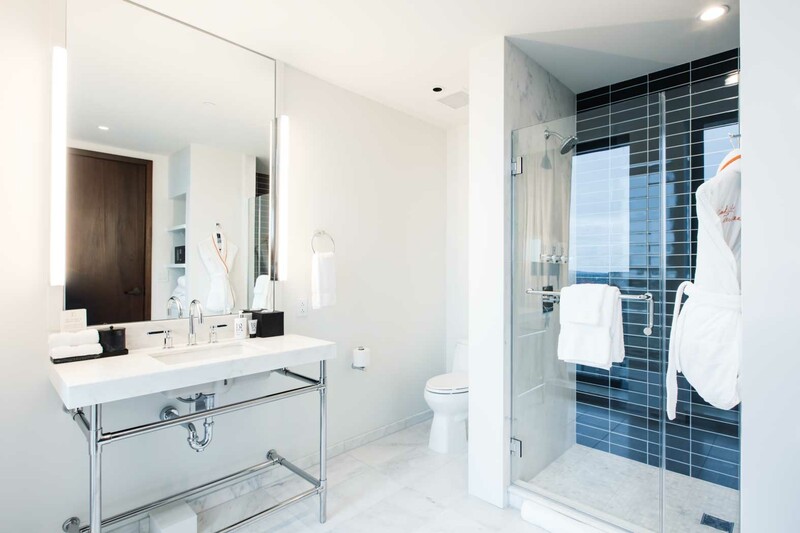 Penthouses East and West can be combined for an incredible, private, whole-floor experience. Size matters. Start living large (very large). 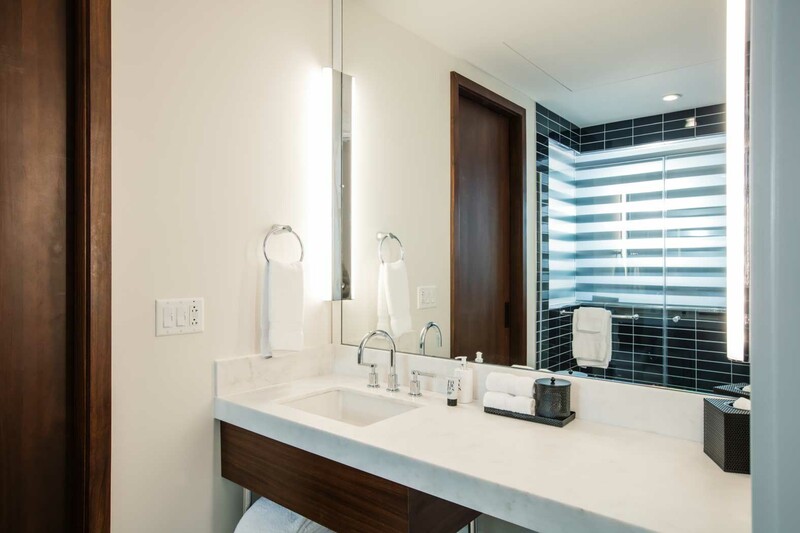 With the whole shebang, you get take-over rights to Penthouses East and West. 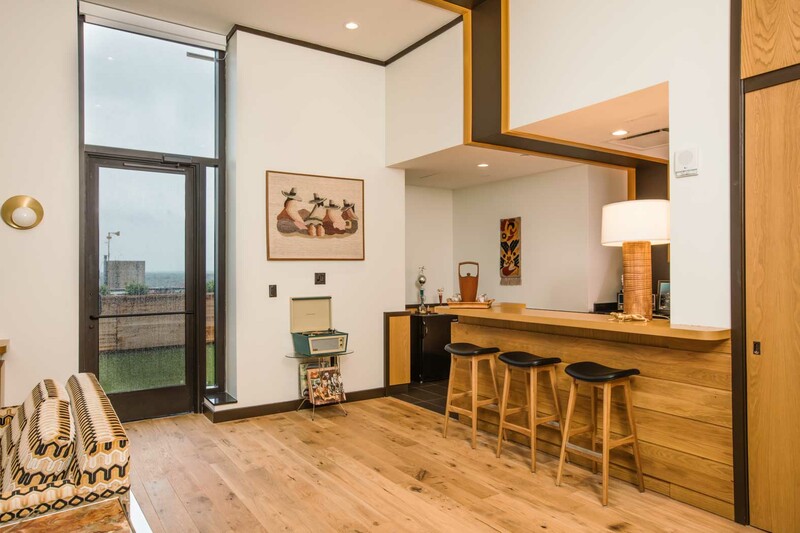 Yep, over 1,800 square feet of living space and 2,250 square feet of your very own private outdoor terrace overlooking Nashville. Basically, the world is your oyster and the rooftop is your zip code. Congratulations on doing it right. 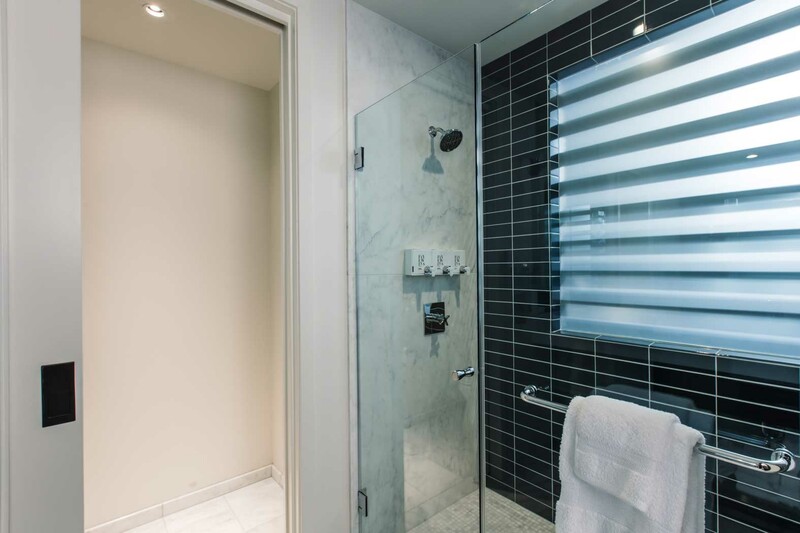 Featuring a euro-top queen bed, marble peek-a-boo showers, luxe bathrobes and mini-fridge with locally-curated snacks, our Standard Queen rooms are an ideal option for the humble traveler. 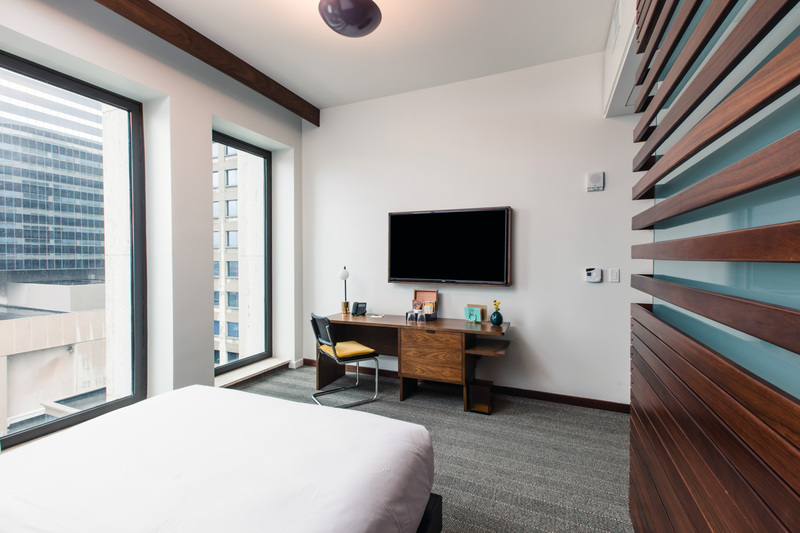 Stay connected with multiple bedside charging options, 55" TV, and lightning-quick WiFi... on the house, of course. Double the fun with two euro-top queen-sized beds and loads of bedside charging options. 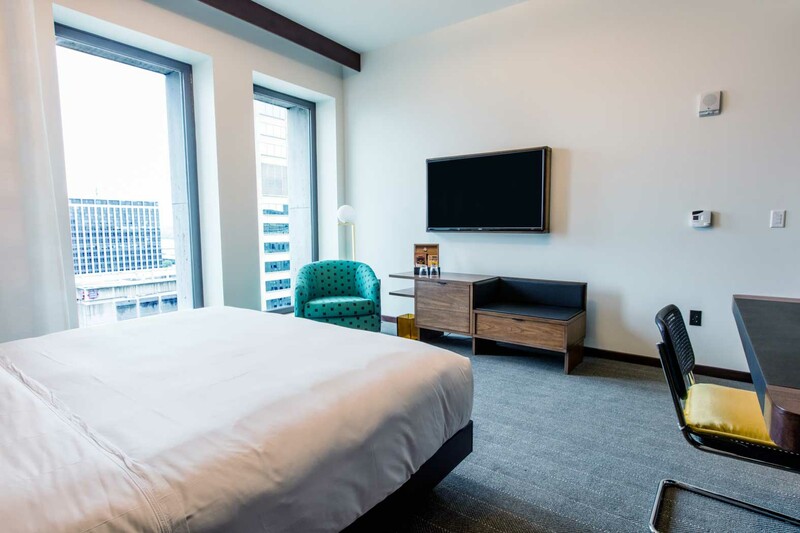 Our oversized Double Standard room comes with a 55" TV, marble shower, separate water closet for more bathroom versatility, and a mini-fridge stocked with locally-curated snacks. 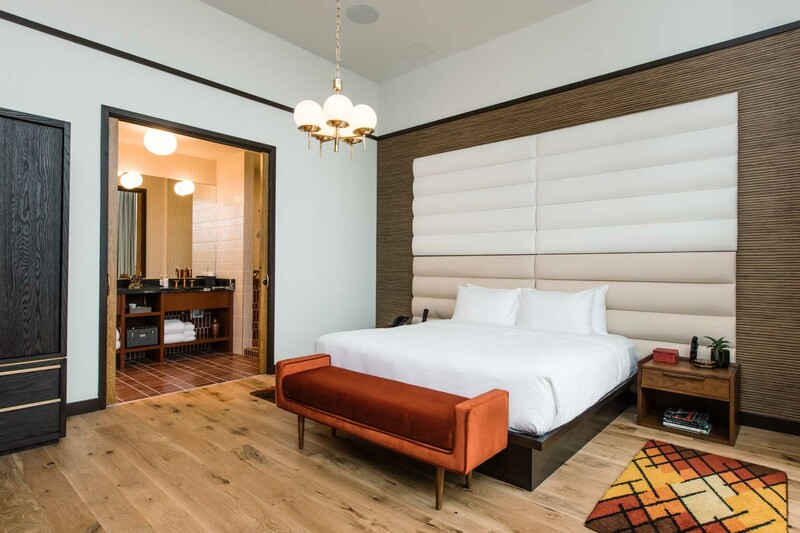 This just might be enough to turn your Nashville trip into a staycation with friends or family.